Can’t thank you enough for your time on this!!!!! 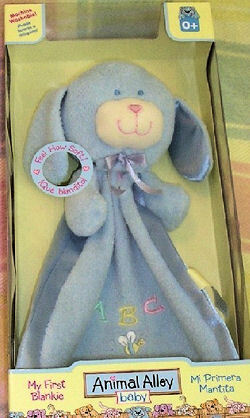 I’m looking for an Animal Alley Baby 13″ blue terry dog head, with blue satin lined floppy ears and small arms attached to a small blue terry blankie that’s embroidered with ABC and a butterfly. It has a blue satin binding and lining. They used to be in Toys ‘R Us but it’s gone. Our child is driving us crazy, because his blankie got lost.